Trias, F. X.; Gorobets, A.; Folch, D.; Oliva, A. The incompressible Navier-Stokes equations constitute an excellent mathematical modelization of turbulence. Unfortunately, attempts at performing direct simulations are limited to relatively low-Reynolds numbers because of the almost numberless small scales produced by the non-linear convective term. Alternatively, a dynamically less complex formulation is proposed here. Namely, regularizations of the Navier-Stokes equations that preserve the symmetry and conservation properties exactly. To do so, both convective and diffusive term are altered in the same vein. In this way, the convective production of small scales is effectively restrained whereas the modified diffusive term introduces a hyperviscosity effect and consequently enhances the destruction of small scales. In practise, the only additional ingredient is a self-adjoint linear filter whose local filter length is determined from the requirement that vortex-stretching must stop at the smallest grid scale. In the present work, the performance of the above-mentioned recent improvements is assessed through application to homogeneous isotropic turbulence, a turbulent channel flow and a turbulent boundary layer. As a final application, regularization modelling will be applied for large-scale numerical simulation of the atmospheric boundary layer through wind farms. Trias, F. X. [et al.]. 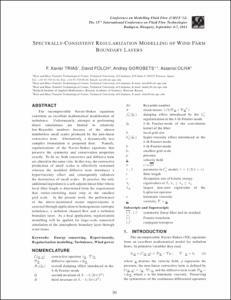 Spectrally-consistent regularization modeling of wind farm boundary layers. A: Conference on Modelling Fluid Flow. "Conference proceedings: Conference on Modelling Fluid Flow: CMFF'12: the 15th event of international conference series on fluid flow technologies held in Budapest". Budapest: 2012, p. 96-103.